Tidbits from the Tremaynes: I Hafta Ask. What is the proper texting etiquette? Let me also preface: I receive texts at all hours. Couple months back, we were all woken up, ev.ery.single.morning, for an entire week, by an early morning, unimportant, text. I am so, so sorry for you. Don't text me, though. I am NEVER awake at 5 a.m. NEVER. I believe the same phone rules apply to texting: if you wouldn't call someone to tell them something unimportant at ten minutes after midnight, then you shouldn't text them, either. That's what email is for. Do you receive a notification when you receive a text? Perhaps the answer to this is simply that I need to turn off the sound for texts and problem solved. Okay. Whew. I really needed to get that off my chest. Moving onward. Let's talk about biz-nis. Because I am on a roll, here at home. I now call this new set of projects. . . I have a list, and this list is loooong. There are about 5 million things I will be building, rearranging, and cleaning in this house to make my life just a smidgen easier. And I will start with turning the ring off for texts. has changed my life. It is such a beautiful thing. My kids totally hate it. Doesn't take away from the beauty. Let's start in the kitchen, where I spend 80% of my life. You know. Scrubbing those pots and pans. The whole world is doing this, and I just jumped on the bandwagon. I took off a cabinet door, and poorly taped the inside of 'er off. Does it look like I'm doing this at midnight? It's like 5 p.m. So sad. it's cold in the garage. 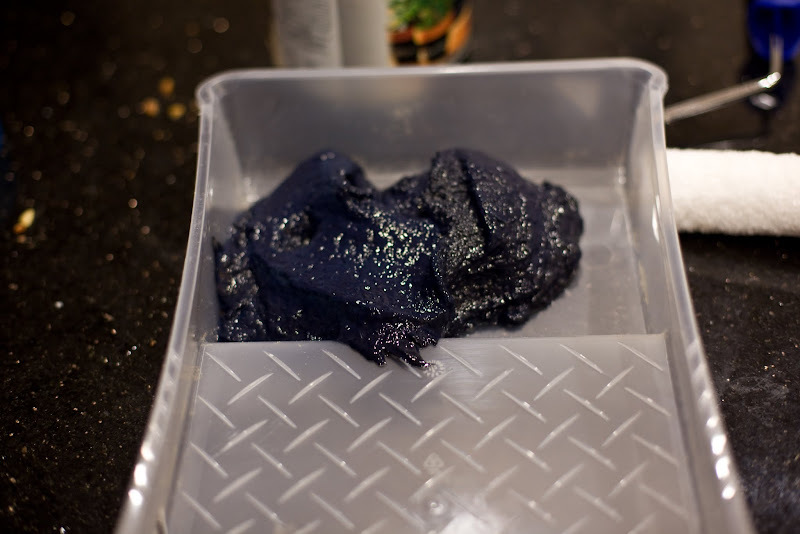 Cold enough to freeze my chalkboard paint into a massive glob of goo. Doesn't matter. It still spread and dried. to write measurement equivalents on my new chalkboarded cabinet door. And she did a lovely job. Have I told you that my handwriting is at about a 2nd grade level? It is. and now I can actually find my measuring crap. It's a miracle. Pay no attention to what's actually inside the cabinet. It's all part of my master plan. I love my sleep too! Which makes me late for work more than not... Anyway, if you have an iPhone, you can set it for an automatic Do Not Disturb (DND) mode in settings. You pick the times, it silences your phone automatically. There are a lot of bandwagons I'd like to jump on if I didn't live in an apartment!! Your cabinet looks great! I think texting at any hour is totally acceptable. If it was important I think the other person would call. Texting allows you to get and send information at your convienence. If I'm asleep when someone texts me I reply when it's conveinent for me. If you are a light sleeper then you should flip that switch on the side of your phone to silence it. I love that cabinet!!! What a great idea. that chalkboard is brilliant!!! totally marking this and doing it! Sweet! Love, love, love this idea! Stealing, I'm totally stealing. As I'm reading this I'm opening the cabinet doors in my kitchen to see where on earth I can do that!! AWESOME idea!! You are so smaht! Ummm...I text anytime of day or night, whenever the mood strikes. I do however put my phone on silent when I go to bed so if anyone does it to me, I don't hear it! 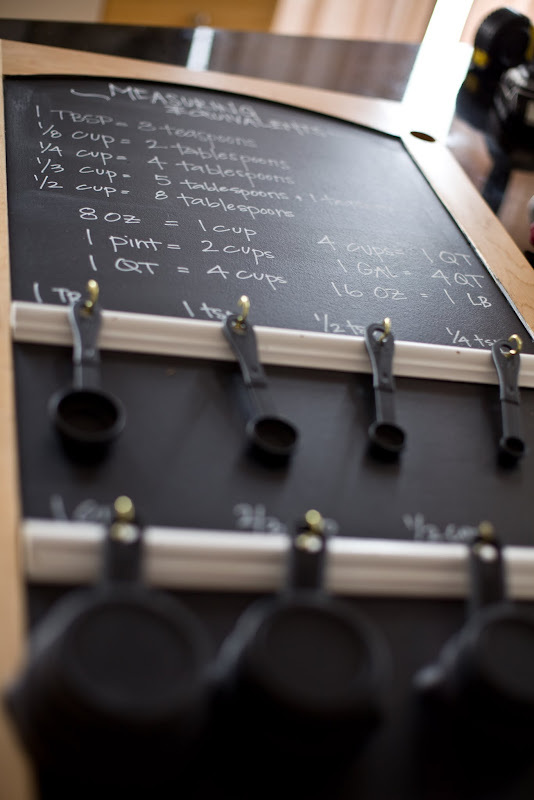 Anyway, how much do I have to pay you to come put one of those chalkboard measuring cup things in my kitchen??? And yes, I am serious! Its awesome! I keep my mobile phone in another room at night and my texting ring is very quiet. On the other I do miss a lot of texts sent to me. I love your chalkboard. I've saved the photo because I want one in my new kitchen!!! Thank you for the great idea. I too am on an Organise 2013 plan in the house and garden starting with a whole new kitchen. I have an ipone and I keep it on silent after I go to bed. So I may receive the text, but I don't know it until I choose to get up in the morning. Definitely find the silent button or the DO NOT DISTURB mode if you have a smart phone. Your texting etiquette question made me giggle, because I just had a similar conversation with my best guy friend who NEVER responds to texts until 2-5 days later, but I know he must receive them. He also recently "yelled" (aka texted in all caps) at me because I texted him at a time where I knew he would probably still be sleeping. My bad, but I did it anyway. And your cabinet is AMAZING!!! I'll have to show this idea to my friend Tiffany because she's the only one I know that has a house & the guts to do awesome things like this to it. Manners, much like grammer, have gone straight down the pooper with the advent of cel phones. Any one who knows me knows to text me at a proper hour. I adore your cabinet! Another fabulous project! I am in LOVE with the inside of that cabinet door!!!! I think I just might have to copy you....someday!! That is just freaking AWESOME!!! I say this with lots of love... if you are being bothered by texts at 5 am, that's totally your fault. ;) Why on earth do you have to have your phone by you when you sleep anyway? And if you use it for an alarm clock, for heaven's sake, turn the texting sounds off at night. I think texting is like emailing... do it when it's convenient for you. If I text someone at 5 am, I do not under any circumstances expect an answer right away. If it's an emergency, I would call. Between 9 and 9 I don't text/call unless I KNOW they're awake. Like the hubby at work. I had a visiting teacher 4 wards ago that called me (pregnant with child #1) at 7 am?!? What the?!? The 5am texting must be from us people on the other side of the world!! Sorry!! I don't get up at 5 AM...I get up at 3AM! Ha! But I don't text anybody till after 9!! Unless emergency of course. But I always get up early and get my blog work and photography editing done! And that interior cupboard door is fabulous!! I love it and will have to do similar!! So cool! I have so wanted to do this! It looks kinda easy. Maybe I could do it. But only if your friend comes over to write mine too. I work weird-ish hours (I get up at 4 am) so I'm super aware about texting etiquette. I won't even text my husband before I know he's awake. Maybe they forgot to silence their phone, or wake up just from the light from a text (not all of us have fancy DND options) and it's just not necessary! I love your cabinet. What a great idea. I am always losing my spoons. I am featuring this at somedaycrafts.blogspot.com. 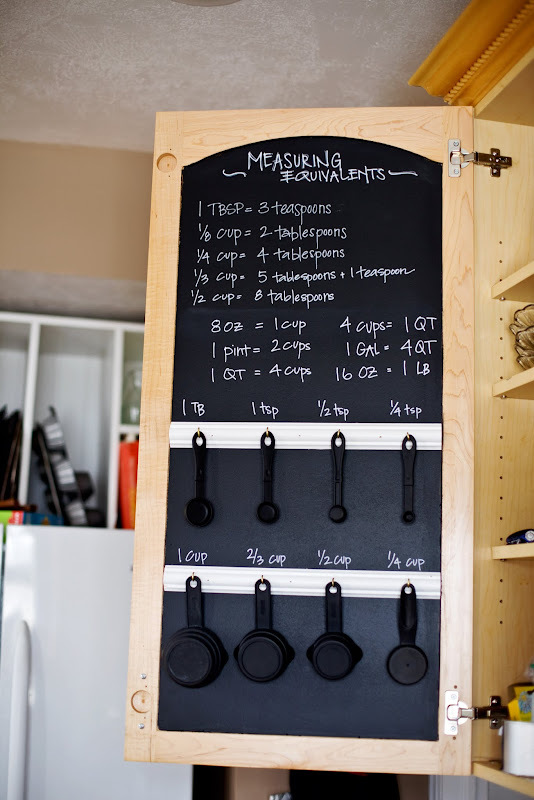 I have planned on doing this with my measuring cups and spoons also - for nearly a year! I was in the process of redoing a kitchen and then my husband moved us to my mother's house. She died in July and now I have to start over AGAIN to set up/establish a home. The thing is that the house is 100 years old and the kitchen was put in in 1986 and I don't want to do anything that would mess up and be a big mistake. Ya know? Advise? I love this! Organizing my measuring cups/spoons have been on my to-do list for ages now. I love the conversion chart, can't tell you how many times I could have used this. Genius! Love this idea. Thank you.. I need to organize so much it's sick. I've come though to accept that fact that part of being a Mom is doing the same things over, and over, and over again - this is where better organization comes in handy. Can your friend come write on my chalk board as well? 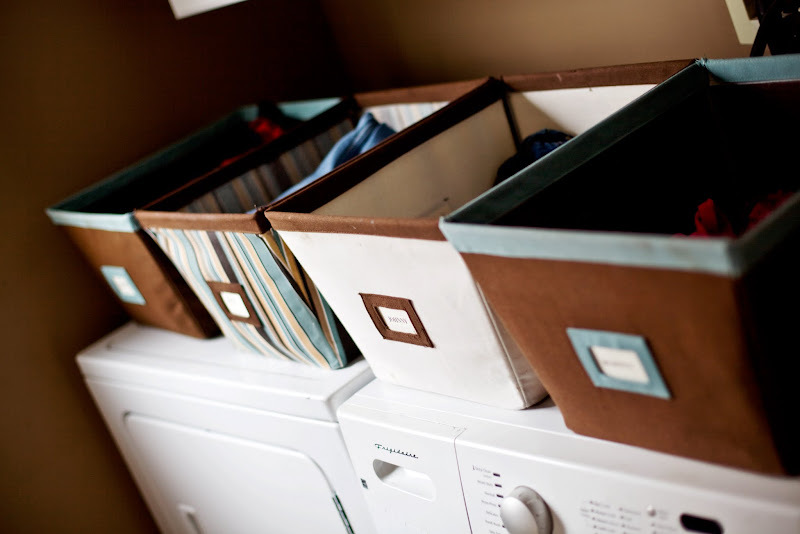 Clean laundry bins, YES! My mom used to do that, and I've always *meant* to do it, but I just got around to it a couple of months ago. Before, I would send my kids off with small stacks to put away, but good luck getting them to come back 5 times, and get *all* the stacks into drawers (and then two days later and 5 minutes before carpool they're like "Mom! I don't have any underwear!). The bins seem to actually work (knock wood, fingers crossed). How did you attach the rulers to the cabinet? I did this with Velcro strips and the whole thing keeps falling down! How did you attach the trim pieces on the inside of the cabinet? I'm sure a nail would go through. Glue? Soooo doing this....waiting for your reply! Thanks! 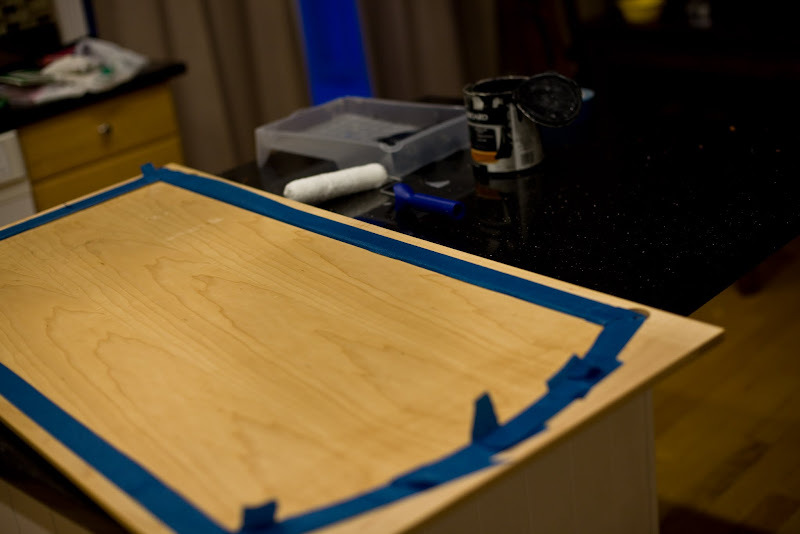 Yes, as Joanne Y. posted above, how did you attach the leftover molding trim to the cabinet? Was it with wood glue, small nails, a combination or both materials or something else entirely? Would love to do this in one of my cabinets at home. Thank you for such a great idea and tutorial! I downloaded an amazing app called Quiet Sleep that allows you to set a schedule on your phone, and disables notifications for you, including text and calls. It also allows you to pick certain contacts to bypass this app, if you choose. For example, I have Sun-TR 9p-9a as quiet time, with my husband and parents allowed to bypass, but calls only, not texts. Because I know they have sense, and wouldn't be contacting me unless it's an emergency. So I got the part about using chalkboard paint (the black). But how was the white lettering done? Maybe I am missing something here, I really don't think you used chalk. The project looks really good :) Thanks for the inspiration. What an adorable idea of a kitchen cabinet! I've been thinking about doing something different in my kitchen, and I think this would be perfect! Lately, I've been trying to get better at cooking, and I think having something like this reminder board would be wonderful to have! I'm definitely going to look into trying this! Thank you so much for the idea! I love this project. I am always struggling with what to do with measuring cups and spoons. I'm dying to know though....is your measuring cup set really in the volumes: 1/4 cup, 1/2 cup, 2/3 cup and 1 cup? I've only ever seen: 1/4 cup, 1/3 cup, 1/2 cup and 1 cup....will your friend do a re-do? Love this idea as right now I tape lots of sheets of paper to the inside of my cabinets, so with this ... just need to decide where to keep the chalk. I just found this post and i can't wait to try it out. I'm all up for organisin our kitchen - wayyyy too much stuff so thanks so much for this idea. Cute idea. What type of white ink pen did you use? Love the contrast. Sleep? What's sleep? my husband tells me it is overrated, but I would really like to find out for myself. I LOVE this idea!! I do have a magnet on the fridge with a conversion chart, but someone thought it would be a good idea to put it on the side where the fridge slides in next to a cabinet .. ummm my x-ray vision isn't what it used to be! Plus the kids, who are all over the age of 15 now, do not like where I have the measuring utensils and put them where they think the utensils should go. Where's that - I have no idea! Anyway, thanks so much for sharing - fabulous! very good blog.thanks for posting.